Bosch all-purpose Progressor blades offer fast, clean cuts through wood with nails, metals, particle board, and other materials. Patented progressive tooth design produces fast cuts and long life in thick and thin materials. 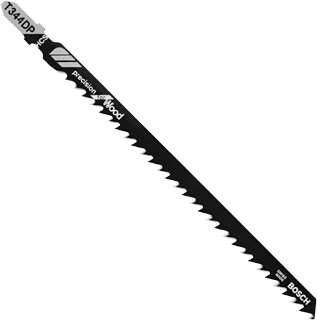 T-shank design for maximum grip and stability which fits 90% of all current jigsaw makes and models. Application Thick and thin materials like wood with nails, plywood, particle board 3/16"-3-5/8", metal 3/16"-3/8", non-ferrous metal and aluminum 5/64"-1-1/4"
T211HF Accurate for Wood with Nails 8 Teeth Per Inch 3 5 Wood with nails, plastic 1/8" - 1-1/4", non-ferrous metal and aluminum 1/8" - 1/2"